The temple that we see in front us is of 4th B.C. cent. and fifth in order at the same place, according to a mythical tradition of Delphi. According to this tradition the oldest temple of Apollo was simple hut from branches of laurel and the second from bees wax and feathers. From the third in order temple whose constructors were considered the mythological architects Trophonius and Agamides, were found architectural members, built in newer buildings that dating around 650 B.C. The temple was destroyed at 548 B.C. and immediately began to be built the 4th in order big archaic temple of Apollo with money that was assembled by various Greek cities. In the southern side, the big polygonal wall retained the land of the dike , above which the temple was built. In the construction of the archaic temple contributed after 513 B.C. the Alcmaeonids, the known Athenian family, which had come to Delphi exiled by Peisistratids. The Alcmaeonids finished with their own expenses the temple manufacturing the facade from parian marble, while the agreement provided limestone as in the rest of the temple. 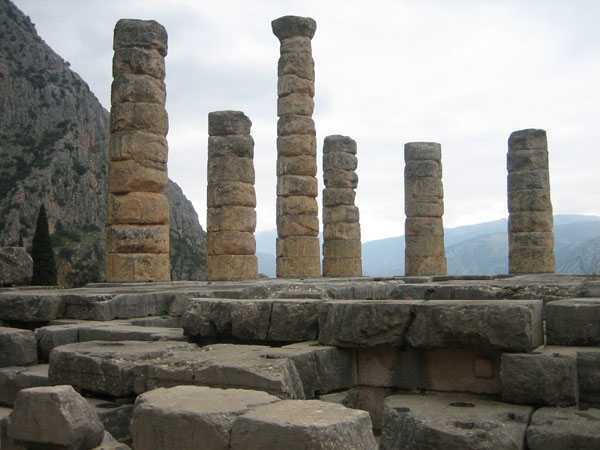 The temple had dimensions 6x15 columns in the exterior and double internal colonnade at the cella. Very important for the archaic art are the pedimental sculptures , that are exposed in the museum, and depict in the eastern the arrival of Apollo with Artemis and Leto at Delphi, where they are welcomed by youths males and females, while in the western, battle of Gods and Giants. The archaic temple was destroyed by an earthquake at 373 B.C. and began to built immediately with Pan-Hellenic contributions the new temple. However his construction delayed because of two holy wars and finished around in the 330 B.C. by the architects the Corinthian Spintharos, Xenodoros and Agathon. The temple of 4th cent. had the dimensions, the type and the internal division of his precursor, and in it's pediments that were made by the Athenian Praxias and Androsthenes, were depicted the Apollonian trinity (Apollo, Lito, Artemis) in the eastern, the sunset of Helios, and Dionysos with the Mainads in the western. What we know from the interior of the temple comes only from the ancient writers because there was nothing found from the excavations. In the walls of the precursor temple had been written wise men expressions such us "Gnothei se ayton - Know myself", "Miden agan - nothing in exaggeration" etc, as well as the mysterious letter "E". Also in pronaos existed a cupreous picture of Homer. In the cella was found an altar of Poseidon (an older holder of the sanctuary too), the iron throne of big poet Pindar and the altar of Hestia with unquenchable fire, above in which according to the tradition Neoptolemos son of Achilles was killed .